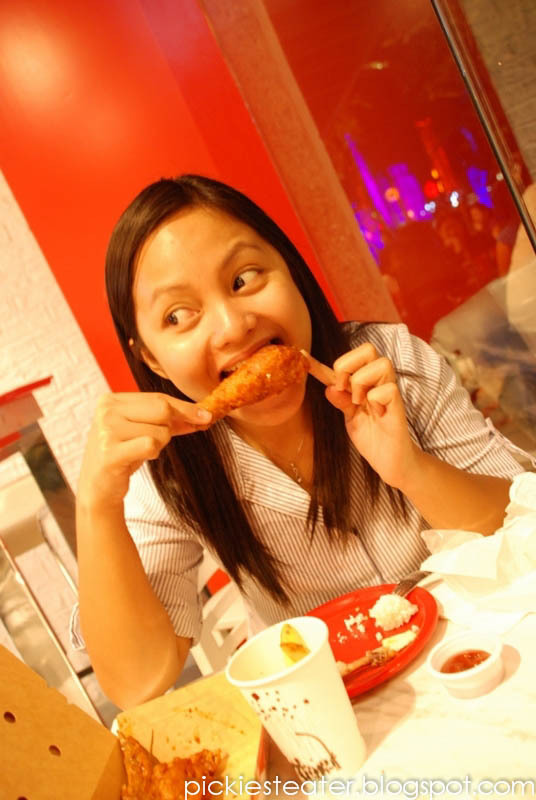 Late last year, when Bon Chon Chicken opened up shop at the Ayala Triangle Gardens, I had so many people go up to me to ask if I'd ever been there, and I got tagged to numerous pictures of half bitten chicken wings on face book! 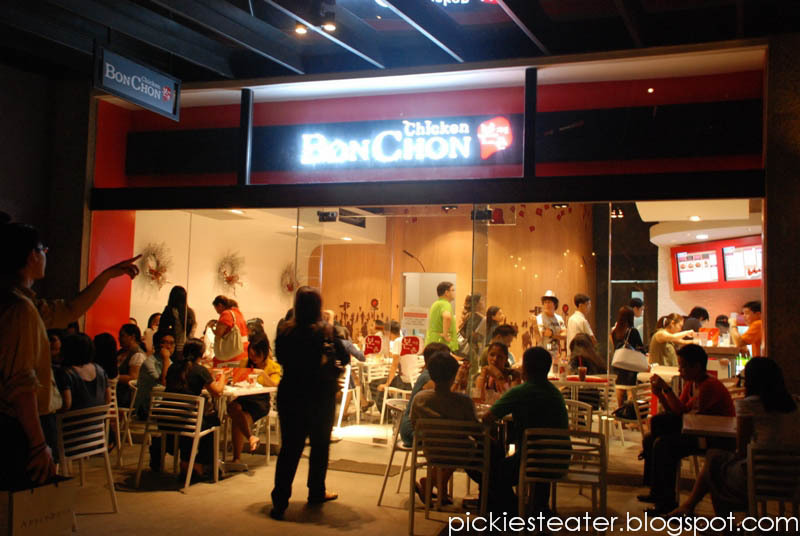 To be honest, I had never heard of Bon Chon Chicken before seeing the sign in Green Belt where there second branch was set to open by late December. A little research showed it was voted the "Best Chicken in America" (Although I'm sure Foghorn Leghorn demanded a recount). One evening, in which the schedule of Rina and I finally matched, we decided to check out what the hype was all about. What is it with this chicken that seemed to drive people insane? Rina's good friend, Zee always gives us some awesome suggestions for places to try. She was the one that suggested we go try Wingman. 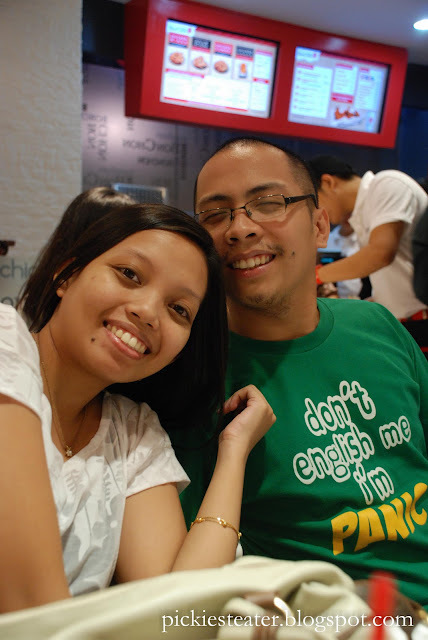 This time, however, she was emphatic that we try Bon Chon - almost like our lives depended on it. Taking that into consideration, Rina and I, armed with her trusty camera, and my voracious appetite, embarked on a journey that would unveil the secrets that lurk within the mysterious Ayala Triangle, and Bon Chon Chicken. Almost 9pm, and it's still full? Basing it on everyone's experience, we anticipated a huge crowd, so we deliberately went for a late dinner (Around 8:45pm). Much to our surprise, the place was still pretty much packed. Rina went down to get us a place to sit while I parked the car. I get a call from her a minute later and she tells me that I better get there soon, because it was a madhouse. She hadn't found a spot yet, and there was no system that would help customers get a table. Basically it was every man for himself. This Bon Chon Epidemic was a lot worse than I thought. The big guy in green? He must have lined up around three other times, I kid you not! By the time I got to Bon Chon, Rina had finally gotten us a table. She did this by standing behind a couple who was finishing up their box of wings (I usually just make monster chomping sounds while they're chewing. It actually works), until they got the hint. Rina was annoyed because there was a table of four girls who had empty boxes on their table (obviously done eating), and all they were doing was swapping really shallow stories with one another, despite seeing the crowd of people waiting for a table. I ordered their French Fries (P45) hoping it was something out of the box. It wasn't. 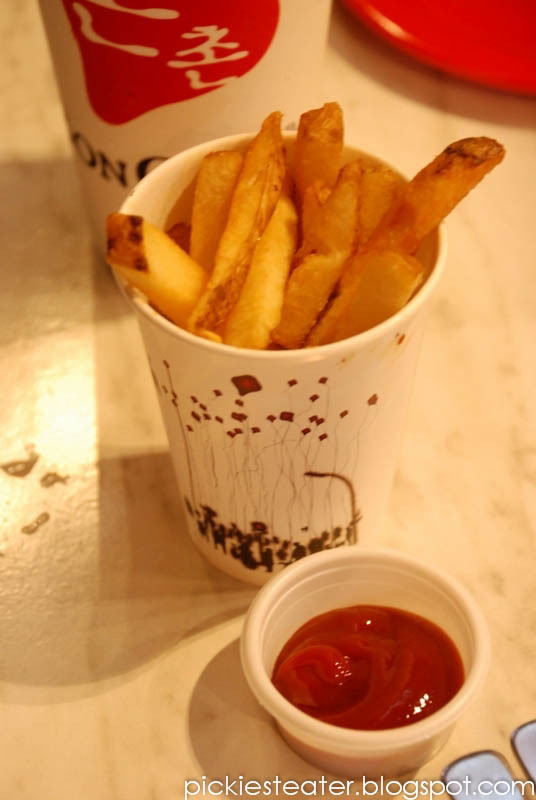 It was pretty much your standard issue thick cut fries, that reminded me of something you'd get from NYFD, but instead of some clever dip, you get ketchup. I don't know about you, but I'm not a big fan of of thick cut fries.. I prefer the crispy fast food type. But that's just me. 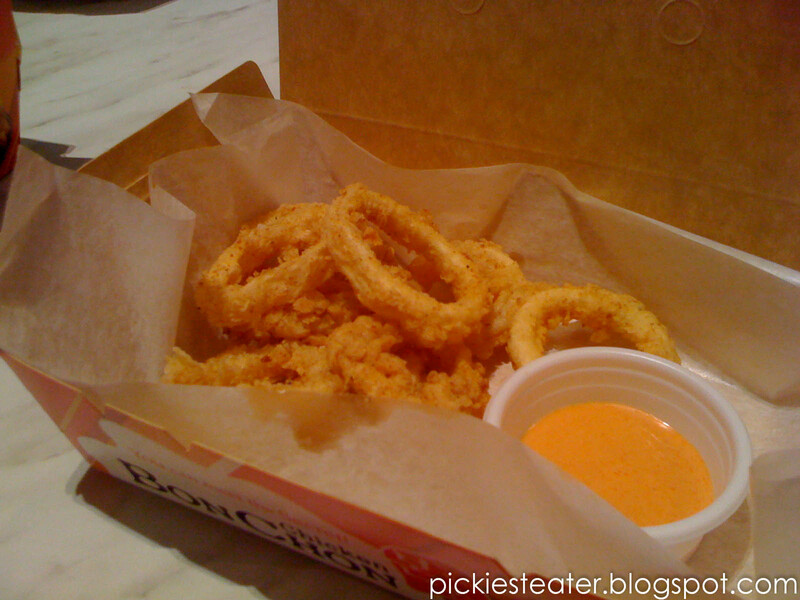 I didn't enjoy their Calamari (P125) It had a strong vinegar taste to it that you could smell even before you put it in your mouth. Calamari is the only squid dish that I eat, so I've had a few in my time. I prefer the American style, with a thick peppery coating like you get in TGIF or something like that. The sauce it comes with, was sort of like a chili mayo, that I didn't like so much either. I had the Bulgogi Wrap (P125) to start things off for me. It's a little bit small for it's price, but it's actually pretty good. The meat, admittedly could have used a bigger serving, was juicy to the bite. The medley of vegetables inside the wrap, I honestly couldn't figure out what it was, but I think i saw a "Kang Kong" in there, helped enhance the Bulgogi flavor. However, in my humble opinion, they could have just eschewed the veggies all together, and just packed it with more meat. The Chicken Sandwich (P125) wasn't really much to crow about either. In fact, I took one bite of it, and put it aside. 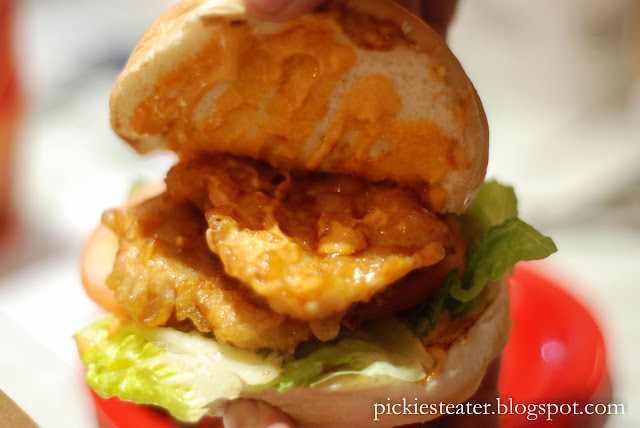 Its basically two small chicken fillets, placed on top of each other, with that chili mayo slathered all over a bun, with lettuce and tomatoes. The problem was, it had that acidic taste yet again, which i really don't like. 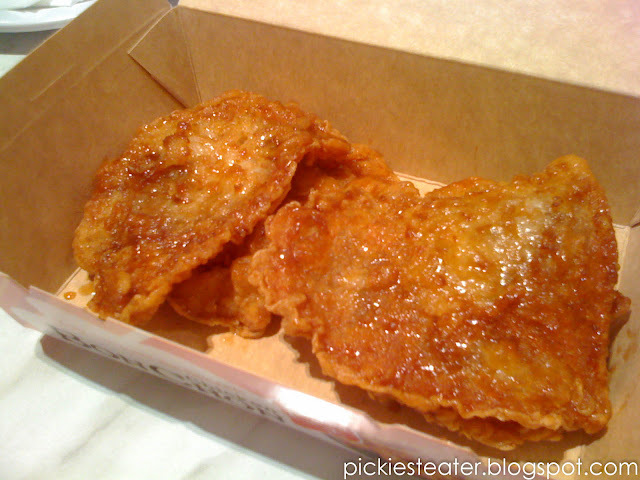 It was like the patties were dipped in vinegar or something before frying it. So far, my Bon Chon experience was experience was underwhelming. 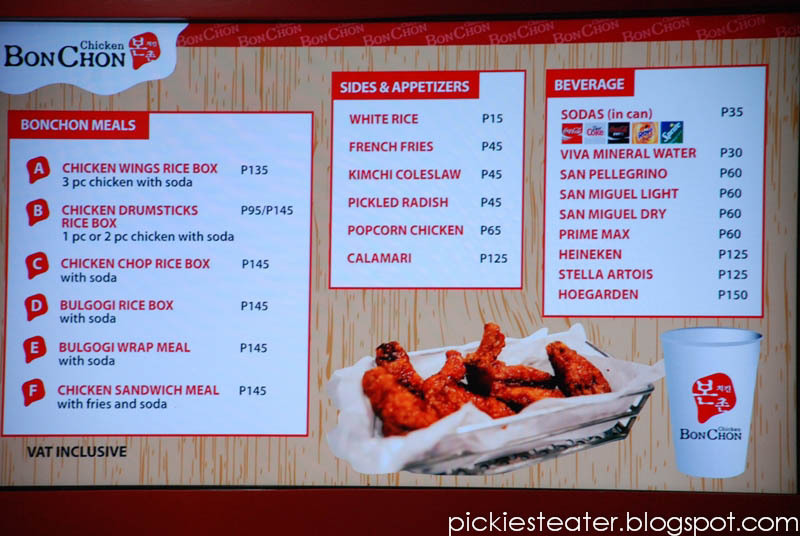 But I do realize that my orders consisted of Bon Chon's "supporting cast", and the stars of the show had yet to make an appearance.. I have no idea what they were thinking when they made this. I don't know about you, but my advice is, Do not order the Chicken Chop. It's.. well.. weird. It tasted like I was chewing on a tough piece of fried flour. It was like a deep fried disc of flour - there, that's the best way to describe it. I couldn't find any semblance of chicken in it, and it was a real task to chew on. 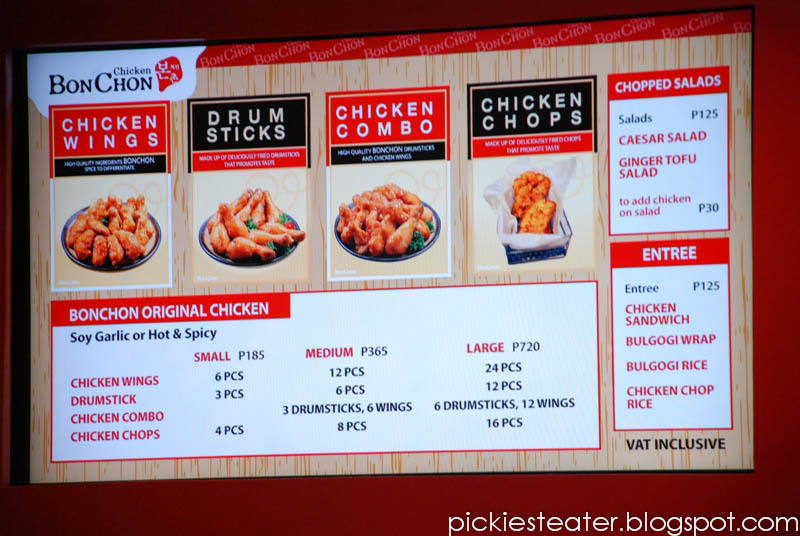 If this was seriously the best Bon Chon had to offer, I wasn't impressed at all. Things picked up with the arrival of the Drumsticks. I haven't tried the "Hot & Spicy" variant of Bon Chon, but from what I've been hearing, the heat pretty much overwhelms the flavor, so you don't appreciate the taste of the chicken so much. 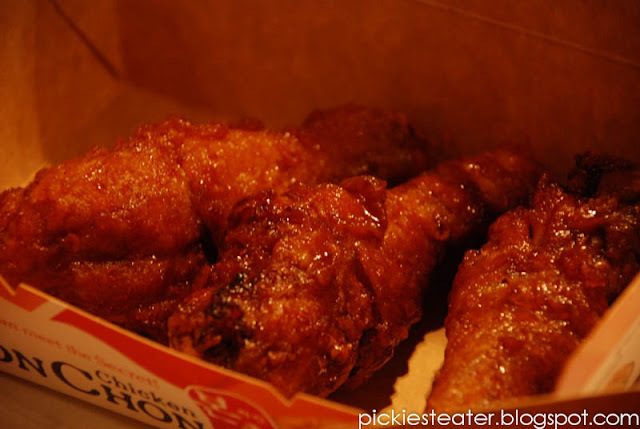 On that note, I strongly suggest you try the "Soy Garlic" flavor to get the full Bon Chon effect. Sorry Aga, but THIS is what "Crispy-licious" is all about. 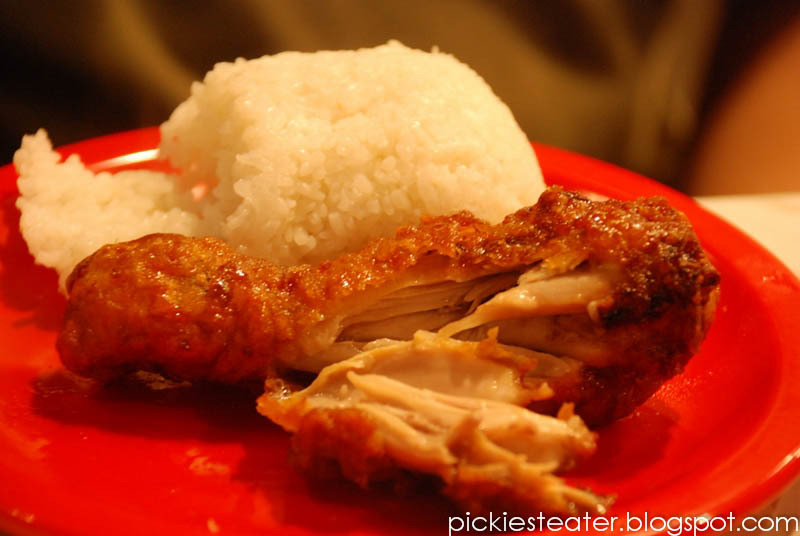 The Drumstick was beautifully coated with the soy garlic sauce, that created a delicious glazing to the chicken skin. Every bite was crispy and bursting with flavor. The meat was amazingly juicy inside, but I felt it lacked seasoning. As I bit deeper into the meat, I couldn't help but feel that it had some sort of a blandness to it, as if all the flavor was concentrated on the skin area of the chicken. But the flavor of the skin showed much promise. 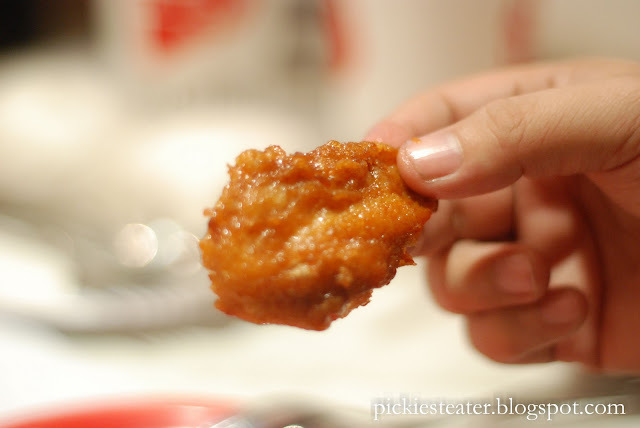 Your Bon Chon addiction begins NOW. Then came the game changer - The Bon Chon Chicken Wings. I have difficulity believing these wings came off a chicken. No, these wings are so heavenly, it's almost as if they came off an angel. 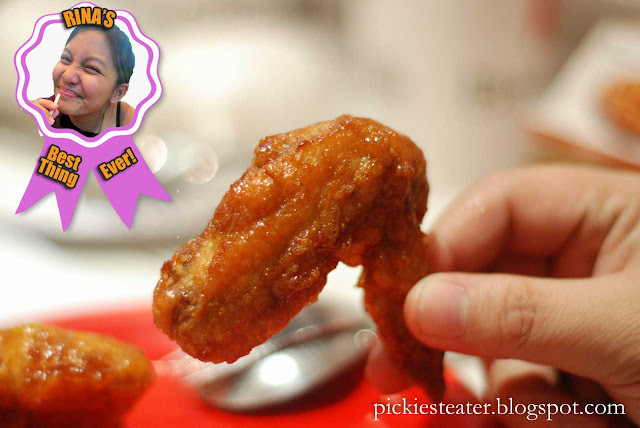 Come to think of it, that would be kinda gross, so yeah, they're pretty awesome chicken wings. All the negative things I had said earlier about the other items on their menu? You can just throw that all out the window because the Chicken Wings are the only thing you'll ever need to order. Just FYI's sake: If you're a big eater like me, you might be deceived when you order, because three pieces of Wings from Bon Chon isn't the same as Three pieces from KFC. 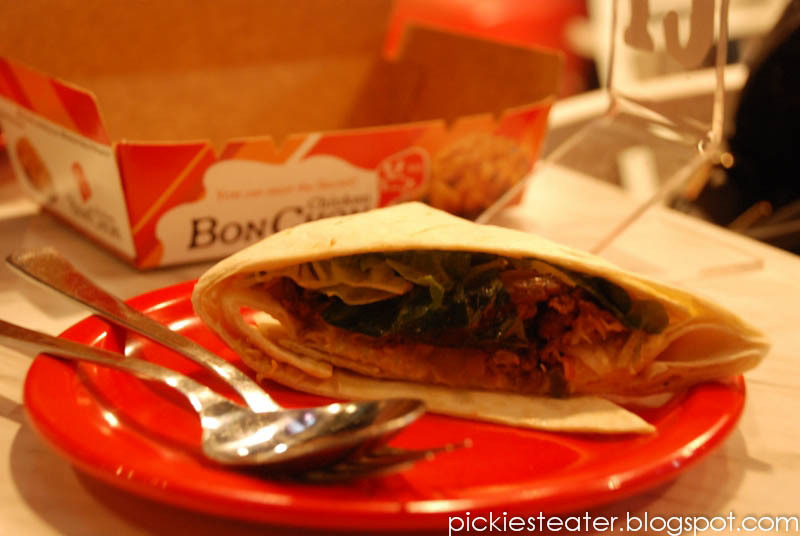 In Bon Chon, a Drummette (above, the "Lollipop") is considered one piece.. While the wingette (Above) is considered another piece. Whereas in KFC, the entire Drummette-Wingette is considered one piece. Long story short, if you order the Box of 6, that's pretty much just equivalent to Three pieces from KFC. But I assure you, as good as KFC is, these wings are far superior. 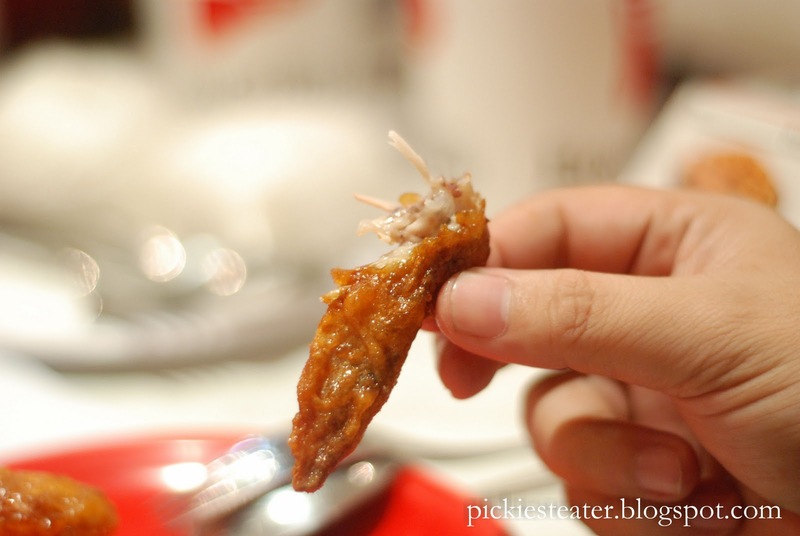 Because of the ratio of meat to skin, the wings don't suffer from the under-seasoning taste of the drumsticks. Meaning you get the full effect of the soy garlic glaze on the skin, and the tenderness of the meat in every bite. This part is usually discarded. Not anymore. 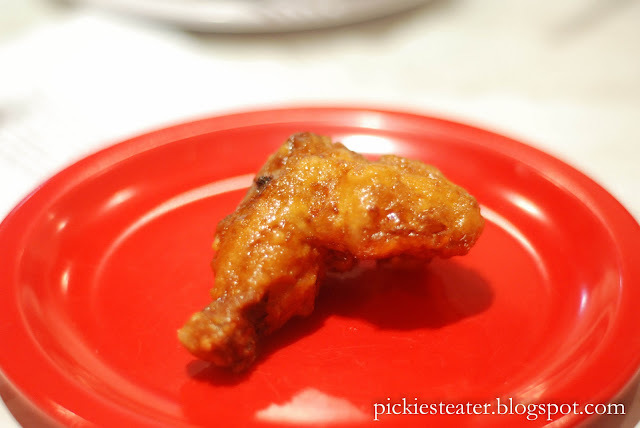 The chicken is deep fried to perfection, you can even eat the wing tip if you want to (I usually do)! As Rina (rather sexily, I might add) jammed one wing after another into her mouth, It was clear that I had just found the newest member of Rina's "Best Thing Ever List". Undoubtedly though, it is in the wingette where heaven lies. I usually remove the two bones in it, and stuff stuff it into my mouth like there's no tomorrow. Seriously, the Chicken Wings of Bon Chon are so good, Rina and I usually end up ordering a box of 12, and a box of 6 (Don't judge us). Anything less may very well put our marriage on the line. Since they opened another Branch in Green Belt 1, I've been to Bon Chon too many times for me to actually count. The chicken wings are so fantastic, you're going to find yourself leaving proper table etiquette at the door. By the end of the evening, I had a chicken wing in my right hand, and a handful of rice on my left. I didn't even care about how the old lady in the next table was looking at me. I just knew I wanted my wings. No one eats chicken sexier than Rina. 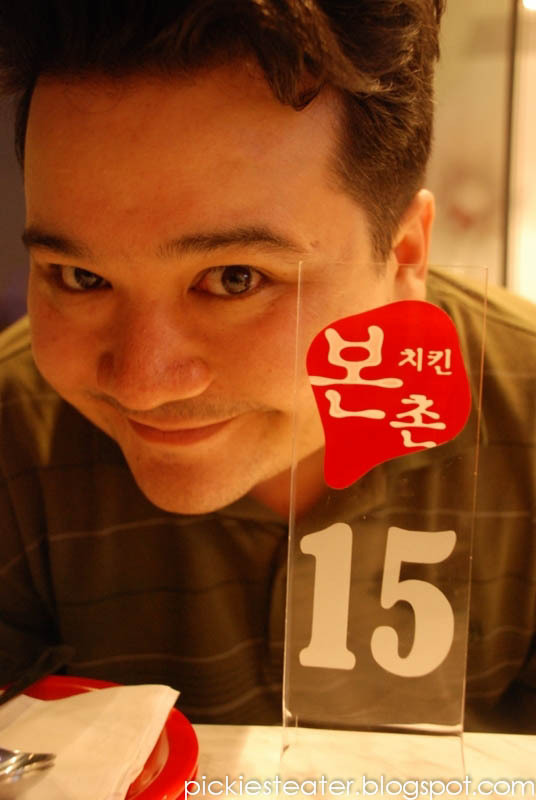 The only suggestion I'd like to make to Bon Chon, is to follow the same type of waiting system as Pepper Lunch. Instead of making their customers stand behind other customers who do actually have tables, they should form some sort of system that would guarantee their customers seats, so they're not left to fend for themselves. The order number they give you should correspond with the table number.. or something like that. Bottom line is, don't make your customers look like scavengers. 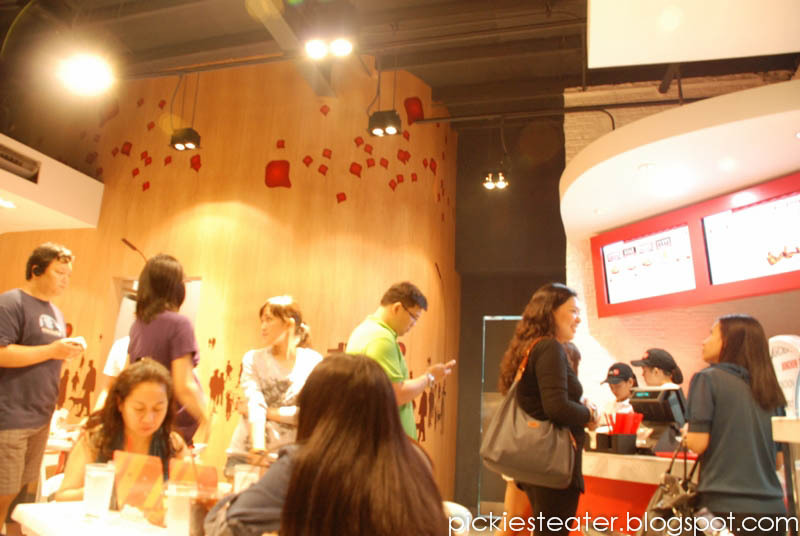 The Greenbelt Branch of Bon Chon is by far, much more spacious, but still manages to get packed during the height of meal times, so try to come a bit earlier than usual - ESPECIALLY if you're going to the Ayala Triangle Branch. Popcorn Chicken, you're next on my list. we only order the chicken wings in BonChon. Best coating to meat ratio! oh, and beer! we've yet to actually order take out and bring a box to the movies. don't you think that's a brilliant idea? as for the other things on the menu, i think it would be better if i just took some chicken wings home and made my own sidings! i can do a better job! pero the wings! the wings! i'm gonna call you if i can replicate them, but that would be such a long shot. hahahaha! Rina can't take the wings to the movie cuz she needs rice! hehe..
By the way, I'll be waiting for that call! Tried the Chicken wings but am not impressed. I guess I was disgusted with the small wing cuts (how can anyone call a wingette one piece?) and cannot even understand where they can find such small chicken (they breed their own?)... So maybe it clouded my taste buds. I am quite unimpressed with the other items in the menu either while customer service seems non existent. The squid rings btw look and taste like leftovers (that is your vinegar taste). But hey, because of what is written here and as I am in search for the best fried chicken ever, I'll give it a second try. And this time, I will order just chicken wings, 12pcs all for myself, and hope I get to heaven just as you did. Hi Arnel! I'm a fan of the wings.. but ONLY the wings.. there isn't much else to go back for.. Lemme know how your search goes! I'd love to hear your suggestions for other fried chicken places! I was supposed to go to the Manang's Blogger event last month, Edlweiza but I had to cancel because my wife was about to give birth.. 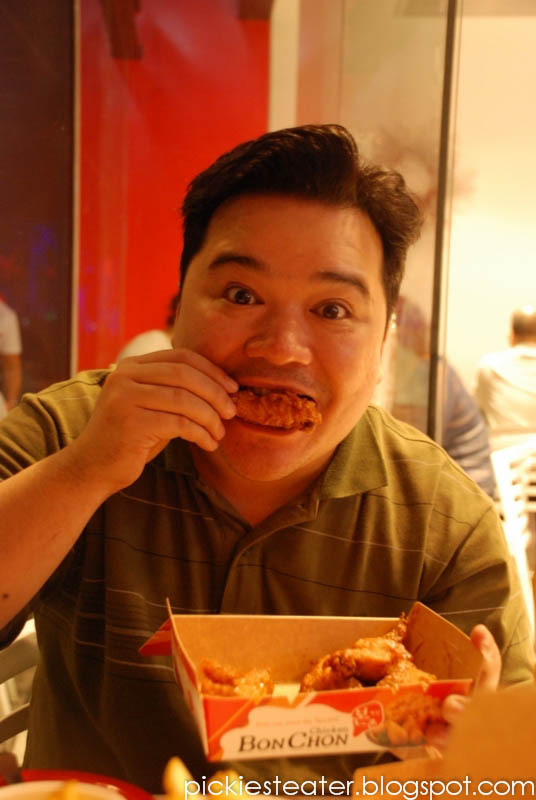 But I love Manang's chicken too! I've always found their chicken too salty for my taste. Was never a fan of it here in SG and still don't get the craze in Manila. HHmm.. I never found it salty.. in fact, if you get down to the meat itself, It can come off a bit bland! I can understand why you don't find it impressive though.. there's a chance I wouldn't be impressed either if we had Makansutra's Huat Huat BBQ Chicken Wings here too! agree with the bland taste of the meat, but hugely compensated by the bursting flavor of the skin. but for people who don't eat chicken skin... that would be a great issue... Its the CRISPY FLAVORFUL Chicken wings and drumsticks that made them famous... love the bulgogi wrap though.